NEW AND IMPROVED- Mini-Tek cases now feature folding handles and wider latches for your convenience. 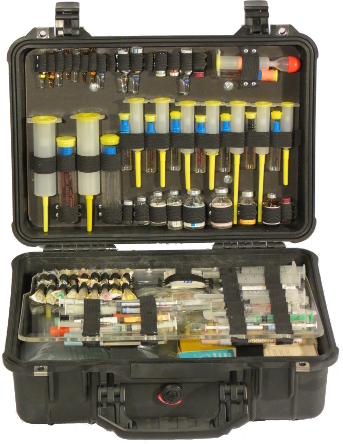 The Mini-Tek D is the most compact ALS drug case on the market. It is designed specifically to house supplies most critical to the needs of advanced life support. All items are individually held in place for unsurpassed organization, accessibility, and security against unnecessary breaking. A middle Acrylite insert is engineered to provide easy access to equipment on both sides. the design provides for easy and uniform restocking and inventory. This proves to be extremely time saving and cost effective.